Tropical north Queensland is one of the best destinations in Australia. The road between Townsville and Cairns is a great coastal drive. In its southern half it goes through eucalypt woodlands, but these change to lush tropical rainforests in the northern half. It goes past some great waterfalls, beaches, wetlands and national parks. The coast was heavily damaged by tropical cyclones Larry (2006) and Yasi (2011), but most things are back to normal now. Townsville. Poster by AllPosters. Click on thumbnail to buy. Furthest south is Townsville – the town called Brownsville by the people of Cairns, who like to point out that their city is green and lush while Townsville is dry and brown, in a rivarly similar to the one between Sydney and Melbourne. And it is true – Townsville sits in a pocket of dry tropics, protected from rains by the mountain range behind it. But this is why Townsville’s skies are always sunny while in Cairns the rains can last for months. Townsville is the second largest city in Queensland, more than twice as large as Cairns (I’ve heard no Cairns people being aware of that fact! 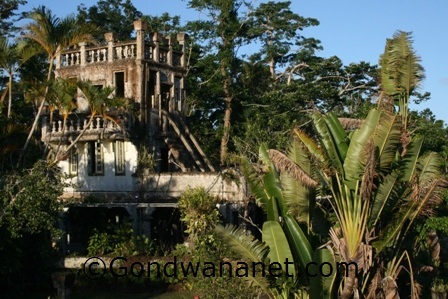 ), and there is a fair bit to do for travellers. In the city centre are some excellent museums and Queensland’s most famous aquarium in the Reef Headquarters. There is some good dining and night life, and a great waterfront – The Strand. Only 20min off the shore is the beautiful Magnetic Island. Just south of the town is Billabong Sanctuary. Some places to stay in Townsville are hotels, resorts and holiday apartments such as Flag Plaza Hotel, Holiday Inn, Hotel M, Ibis Hotel, Jupiters Hotel, Mercure Inn, Palm Waters Holiday Villas, Quality Southbank Hotel, Quest Hotel, Rydges Southbank Hotel, and Strand Park Hotel. Motels include Banjo Paterson Motor Inn, Casino City Motor Inn, Castle Lodge Motel, Central City Motel, City Oasis Inn, Comfort Inn, Coolabah Motel, Summit Motel and Waters Edge the Strand Hotel. North of Townsville are Townsville Northern Beaches Bushland Beach, Saunders Beach, Bluewater, Toolakea, and further north Toomulla, Balgal Beach and Rollingstone. Like Cairns Northern Beaches, they are residential communities with a nice beach, and (unlike Cairns Northern Beaches) most have designated, FREE camping grounds! They are also great for fishing, and for nice, long beach walks. Magnetic Island. Poster by AllPosters. Click on thumbnail to buy. North of Rollingstone is Australia's southernmost tropical rainforest in Paluma Range National Park . There are two sections in the park - the southern Mt Spec, and the northern Jourama Falls. The southern section has the popular swimming holes Big and Little Crystal Creek, Paluma Village, and Birthday Creek Falls and Lake Paluma. All but the Big Crystal Creek are reached by a narrow and twisting mountain road with good views and cool temperatures. Turnoff to the northern, Jourama Falls section of Paluma Range National Park, is further north, 91km north of Townsville. There are national parks camping grounds at Big Crystal Creek and Jourama Falls. North of Paluma Range is Ingham in the middle of some extensive sugar cane country. In the main street is Lees Hotel - a great place to stay and the original pub in the popular song 'A Pub With No Beer ' by Slim Dusty . Just south of the town there are Tyto Wetlands that attract a lot of waterbirds, including the impressive brolgas and jabirus. And seven kilometres out of Ingham is Victoria Mill - the largest sugar mill in the Southern Hemisphere. Many Italian immigrants live in the area and in May every year Ingham celebrates the Australian Italian Festival, with entertainment in the main street and plenty of good foods to sample. Ingham Sugar Mill. Poster by AllPosters. Click on thumbnail to buy. North-west of Ingham is one of the largest national parks in north Queensland - Lumholtz National Park, also known as Girringun National Park. It is a large national park with a lot of driving and bushwalking tracks, that extend all the way up past Cardwell and even west of Tully. 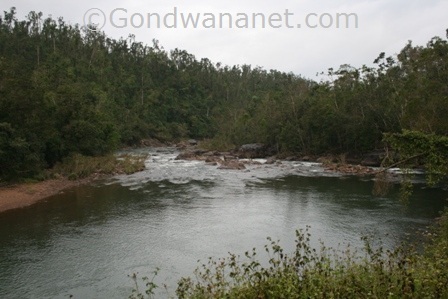 But the southernmost section of the park is inland from Ingham, and the sections that are best reached from here are Mount Fox and Wallaman Falls. Mount Fox is a dormant volcano and you can walk up to the crater. Wallaman Falls are the highest single drop waterfalls in Australia, however be aware they can be dry during the dry season. Wallaman Falls. Poster by AllPosters. Click on thumbnail to buy. Off the coast near Ingham is the Palm Island Group that includes Great Palm Island (Aboriginal community), Orpheus, Pelorus, Fantome, Curacoa, Esk, Brisk and Havannah Islands. Orpheus Island is the second largest after the Great Palm Island. It is a continental island as opposed to a coral cay, but around it is some great coral reef to discover. There are some lovely beaches in Mangrove Bay and Yank’s Bay, and good snorkelling and diving. The island is mostly covered by national park, and there is lots of bird life to watch. Sea turtles also nest on the beaches. The place to stay is Orpheus Island Resort. Orpheus Island. Poster by AllPosters. Click on thumbnail to buy. On the coast east of Ingham are Forrest Beach, Halifax and Lucinda - the southern access point to Hinchinbrook Island. As you drive across the Cardwell Ranges on the Bruce Highway between Ingham and Cardwell, there is a lookout point with some great views of Hinchinbrook Channel - a good spot to stop for a few photos. 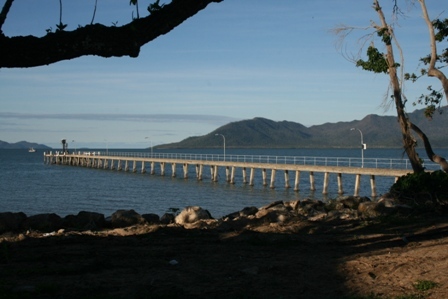 Further north, you can also access Hinchinbrook Island from Port Hinchinbrook just south of Cardwell. Hinchinbrook Island. Poster by AllPosters. Click on thumbnail to buy. Hinchinbrook Island is world's largest island national park, and a beautiful place to visit. There is the Hinchinbrook Island Resort in the northern end of the island, but bushwalkers like to hike the 32-km Thorsborne Trail - a beautiful three-day walk along sandy beaches and through thick forests. There are some good views from the hilltops, and you can camp at Blacksand Beach, Banksia Beach, Zoe Falls, Sweetwater Creek, Mulligan Creek and George Point. Cardwell is a small coastal town west of Hinchinbrook Island, half way between Cairns and Townsville. It was lucky to escape the Cyclone Larry in 2006, but not as lucky in 2011 when Cyclone Yasi hit. It is a nice place to stop - there are good views of Hinchinbrook Island from the beach. West of the town is the Cardwell Forest Drive - a 26-km scenic drive with good swimming holes and lookouts over the town, the island and the ocean. Places to stay in Cardwell include Port Hinchinbrook Resort, Inspiration Port Hinchinbrook and Kookaburra Holiday Park. South of the town is the Five Mile Creek swimming hole, and a bit further south is the start of the Dalrymple Gap walking track in Girringun National Park. Further west is also the Broadwater camping and day use area in Abergowrie State Forest. North of Cardwell is Edmund Kennedy National Park and the small place called Kennedy, where a track goes west to Blencoe Falls. 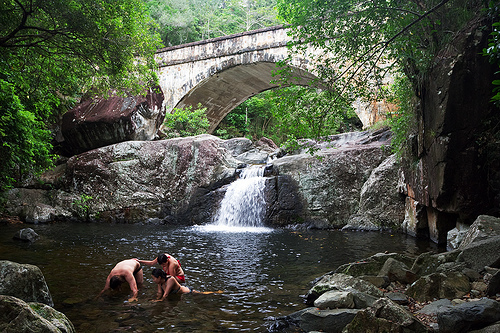 Further north are Murray Falls with some rainforest swimming holes, a walking track and a camping ground. 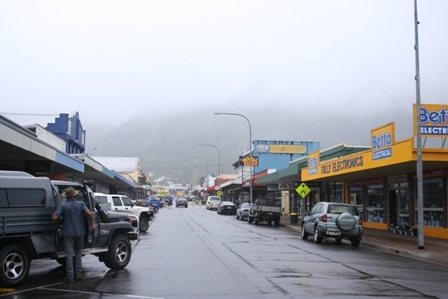 Further north is Tully – the wettest town in Australia, where it rains over 4000mm a year. It's a beautiful town (when it’s not raining) with green rainforested mountains in the background; and as a symbol for all the rain, there is one of Australia’s Big Things – the Big Gumboot. There is also a sugar mill and a swimming hole called Alligator’s Nest, but Tully is most famous for white water rafting - definitely best in north Queensland. Many rafting companies will take you to Tully from as far as Cairns and Townsville. There are many fruit farms in the area and many backpackers stay in Tully (and other towns like Innisfail and Bowen) while earning some extra money from fruit-picking. Places to stay in Tully include Tully Motel, Green Way Caravan Park and Tully Heads Caravan Park on Tully Heads Road. Behind Tully is Misty Mountains – a huge bushwalking area which is actually better reached from Ravenshoe, Millaa Millaa and Palmerston Highway on the Atherton Tablelands. From Tully, a road takes you along the Tully River up to the mountains to the Cochable Creek campsite, which is the starting point of the 14.5km Cannabullen Creek Track that follows the creek with several crossings and a beautiful waterfall. The longer, 35.5km Koolmoon Creek Track follows the local Aboriginal People’s traditional pathway with creek crossings, waterholes and views of Tully Gorge. North of Tully is Mission Beach - a popular holiday destination with backpackers as well as other travellers. It actually consists of many beaches. Mission Beach itself is the central one. South of it are Wongaling Beach and South Mission Beach, and north are Narragon Beach, Bingil Bay, Brookes Beach and Garners Beach. There are some nice shops and restaurants, some rainforest walking tracks, opportunities to see cassowaries, and tour operators that take you to the Great Barrier Reef as well as Dunk Island. Places to stay in Mission Beach include Absolute Backpackers, Apollo Jewel Apartments, Cassawong Cottages, Castaways Apartments, Eco Village Resort, Elandra Mission Beach, Mackays Motel, Mission Beach Hideaway Holiday Resort, Mission Beach Resort, Mission Beach Retreat, Mission Reef Resort, Mission Beach Shores, Montage Beach Apartments, Rainforest Apartments, The Residence Club on Mission Beach, Tropical Escape B&B and Wongalinga Apartments. Mission Beach. Poster by AllPosters. Click on thumbnail to buy. Dunk Island belongs to the Family Islands group (others are Thorpe, Richards, Wheeler, Coombe, Smith, Bowden and Hudson Island). There is the Dunk Island Resort area in the eastern end of the island, but the rest of it is national park. There are some great bushwalks through the rainforest, to some beautiful beaches, and to a lookout point with views over the jetty and the blue waters that surround the island. Dunk Island. Poster by AllPosters. Click on thumbnail to buy. North of Mission Beach is Innisfail - a centre of sugar cane and banana farms that is popular with fruit pickers; and is most famous as the town that coped the worst of the tropical Cyclone Larry in 2006. You can stay in Innisfail at Moondarra Motel or Barrier Reef Motel, and there are also a few caravan parks. A lot of Cyclone Larry devastation was also done along the road to South Johnstone, Japoonvale and Silkwood, as well as Kurrimine Beach. Along that road is Paronella Park - an old Spanish Castle - a very un-Australian but interesting place to visit. North-east of the town is Wooroonooran National Park - a large national park between Bruce Highway in the east and Atherton Tablelands in the west. It protects tropical rainforests that cover the Great Dividing Range at its highest point in Queensland, with the state’s highest peak Mount Bartle Frere (1622m). There is a walk to the top that starts at Josephine Falls, which are reached from the coastal Bruce Highway between Innisfail and Mirriwinni. 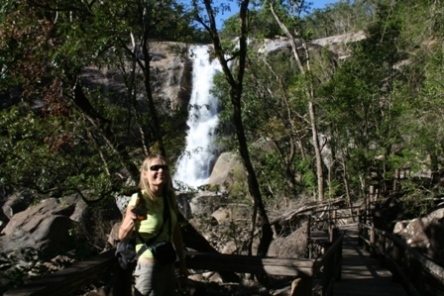 There is also a southern, Palmerston Section of Wooroonooran National Park with a camping ground at Henrietta Creek and bushwalking tracks to different waterfalls, reached from Palmerston Highway. Josephine Falls. Poster by AllPosters. Click on thumbnail to buy. There is a third, northern section in the Wooroonooran National Park with another long bush walking track - the Goldfield Trail, which starts from the beautiful Babinda Boulders west of the small town Babinda, which was another town to be badly destroyed in the tropical Cyclone Larry in March 2006. The rainforests in many parts of Wooroonooran National Park were totally destroyed, with all greenery gone and only bare tree trunks standing - you can still see the broken canopy in places, but the greenery has of course returned by now. Babinda Creek. Poster by AllPosters. Click on thumbnail to buy. East of Wooroonooran National Park, across the Bruce Highway, are some small interesting national parks such as Ella Bay and Eubenangee Swamp National Park. The only time I have visited Eubenangee Swamp, I saw a large saltwater crocodile. I don't know if I had a good luck or what the chances are, but you know they are not zero. North of Babinda the road continues past banana fields, sugar cane farms and small townships like Deeral and Gordonvale until you come to Cairns, and can continue your trip north along the coast of Far North Queensland. Eubenangee Swamp. Poster by AllPosters. Click on thumbnail to buy. Here's a tropical north Queensland Map, where I have tagged the places that I mentioned on this web page. You can click on the tags to see what places they are, and double-click anywhere on the map to zoom it in and see the places closer. Drag the map to move around, and if you want to see the satellite image with Google Earth, click on "Sat" in the top right hand corner.